The fusion of EDM and metal has been very prevalent over the years. From Pendulum teaming with In Flames on "Self vs Self" to Korn delivering their dubstep/metal hybrid album The Path of Totality, these two universes are no longer considered strange bedfellows. 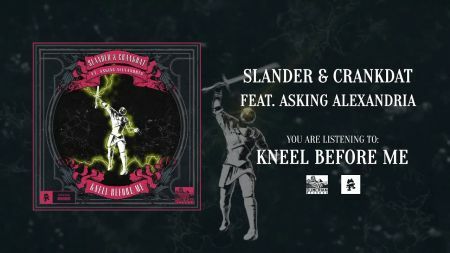 English metal band Asking Alexandria, who released a remix album back in 2011, have been busy supporting their latest self-titled studio album, and they wanted to give fans a surprise. With the help of trap producers Crankdat and Slander, the band unveiled their new song titled "Kneel Before Me" yesterday. The song, which is a collaborative release through Sumerian Records and Monstercat, is available to stream and purchase at all digital retailers. Asking Alexandria recently finished their week-long stint on the final full country installment of the Vans Warped Tour, and starting next month, they're back on the road supporting Godsmack and Shinedown on their co-headlining arena tour. That tour will make its way to Greenville's Bon Secours Wellness Arena on Sept. 21 and the Greensboro Coliseum in Greensboro on Sept. 22. Tickets are on sale to the general public right now. Asking Alexandria's latest self-titled album debuted at number one on the Hard Rock Albums chart and number two on the Top Rock Albums chart. The Matt Good produced record has spawned the radio hits "Into The Fire" and "Alone In A Room."